Updating WooCommerce, its extensions, and WordPress itself needn’t be a nerve-wracking experience. If you prepare well and follow best practice, you can avoid all “my product pages look weird” and “this plugin isn’t working right” experiences. Today we’re going to show you four ways to better manage updates to your WooCommerce store to save you time, keep your store running smoothly, and give you confidence for the next time you see the phrase “an update is available” in your WordPress dashboard. Once you’ve made the decision to build a store with WooCommerce, you don’t want anything to slow you down. If your store isn’t built with longevity in mind, however, you could run into trouble as time goes on. You might see product pages load slowly, extensions stop functioning, or even encounter serious issues like data loss or security breaches. These are all issues that will ultimately lead to one thing: a decline in — or complete loss of — paying customers. To keep your WooCommerce store profitable, you need to build it with long-term stability, safety, and performance in mind. Let’s take a look at how you can build a WooCommerce store that will last for months, years, and beyond. tl;dr The image resizing script, Timthumb, has been retired. We’re removing Timthumb from the WooFramework. Please update your copy of the WooFramework and run the “Remove Timthumb” feature we’ve added, to ensure your website remains secure and up to date. At the beginning of October we announced that we would be officially retiring Timthumb, the image manipulation library that has been used in many popular WordPress themes for years, from our themes including our WooFramework. The main reason is ultimately improved security, as Timthumb itself is no longer under development, and this means that no improvements, bug fixes, or security holes will be patched by its creators. WordPress has also come a long way in terms of how it handles images, and there is no reason to use a third party library anymore. We’ve kept Timthumb in our themes for a long time mostly due to our commitment to backwards compatibility in all our products. Sometimes a theme update deserves a blog post to highlight new features. This is such a time and we think you’ll love the new additions to Canvas, our flagship theme. 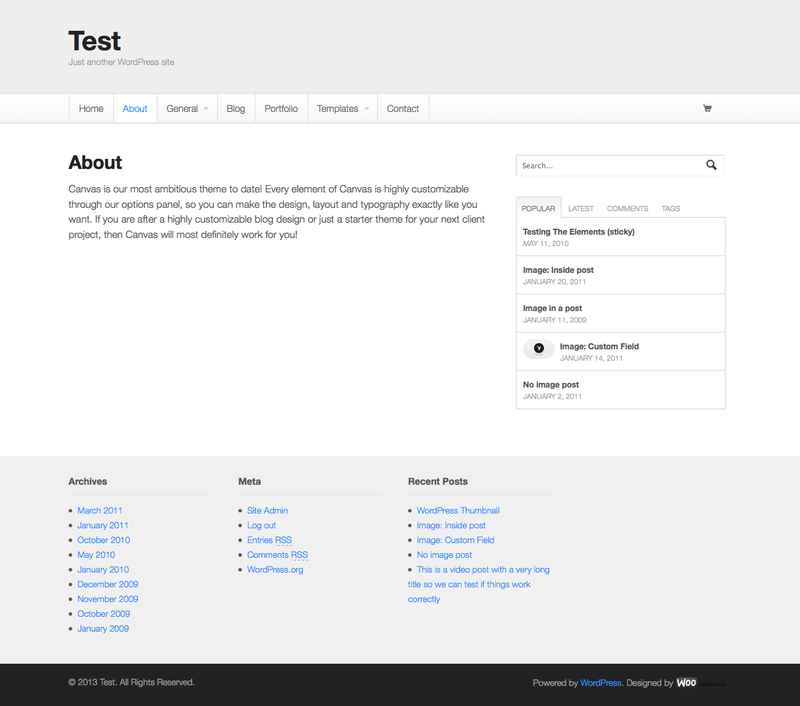 A much used tutorial in our knowledge base was how to make the header, navigation and footer full width. We’ve now added this as an option to Canvas so everyone can use this type of layout. 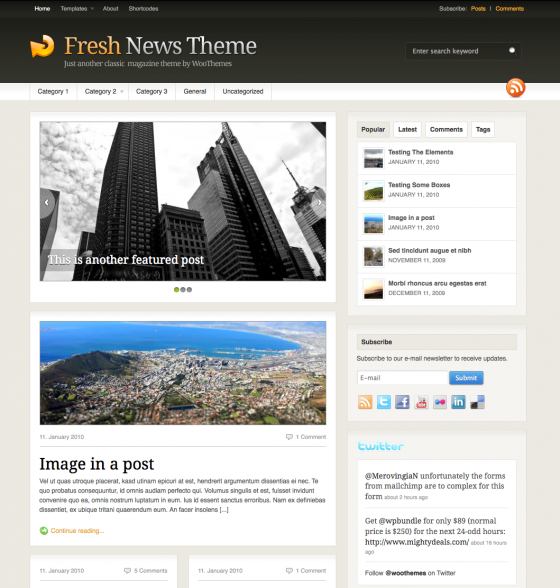 It’s been almost three years since we designed Fresh News, and since then it has been our most sold theme up until recently when Canvas finally passed it on our theme leaderboard. We have continually updated it to fix bugs and make it work with thelatest WordPress versions, as we do with all our themes, but time had come for a complete overhaul to bring it up to today standards. We received some suggestions from one of our users on what was missing from the theme, which was a pity because the theme still had killer looks, but was let down by the seemingly outdated features. We listened to the suggestions and after almost a week of coding we can now present version 3.0 of Fresh News. The theme has been re-coded so it isn’t bound by the strict 960 grid system it used before. It also has a more flexible header now which was restricted in height in the old version, which made it harder to customize. 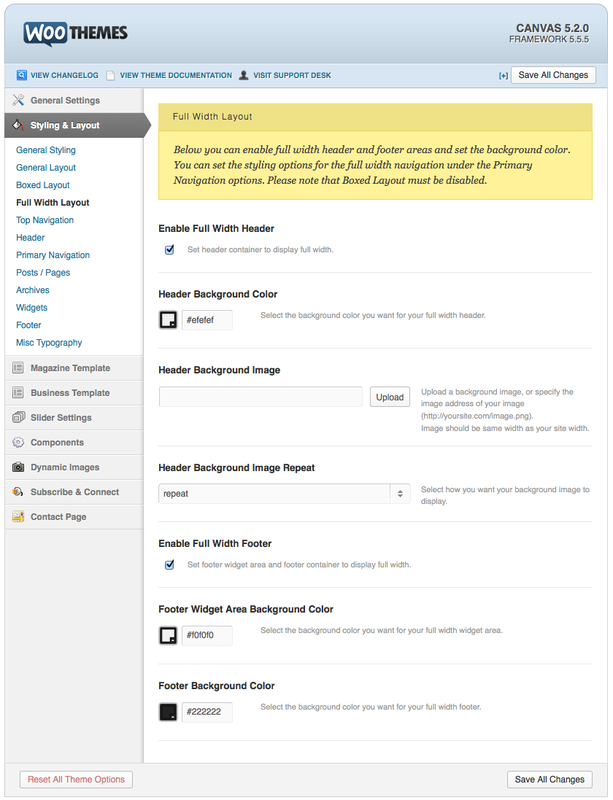 Here is a rundown of the major features, some that you will also see in our other new themes in the future.